Having a video call from a computer or creating a video tutorial about any given topic has been made possible in the last few decades by webcams that can record high-quality footage. These types of cameras are remarkably easy to use, but they also lack some key options that are commonly featured on professional DSLR cameras. The lenses on webcams don't allow its user to set focus manually or to have any control over exposure and aperture values. Digital cameras with interchangeable lenses provide the producer of the webcam video with complete control over the video recording process. In this article, we are going to show you a few different ways of using a DSLR camera for the production of a webcam video. Some DSLR models cannot be used as webcams, which is why it is important to check if your camera offers this option. Many Canon or Nikon cameras have this feature, and some of them even have their own webcam software. Install the software and drivers that came with the camera, before you try any of the methods below. 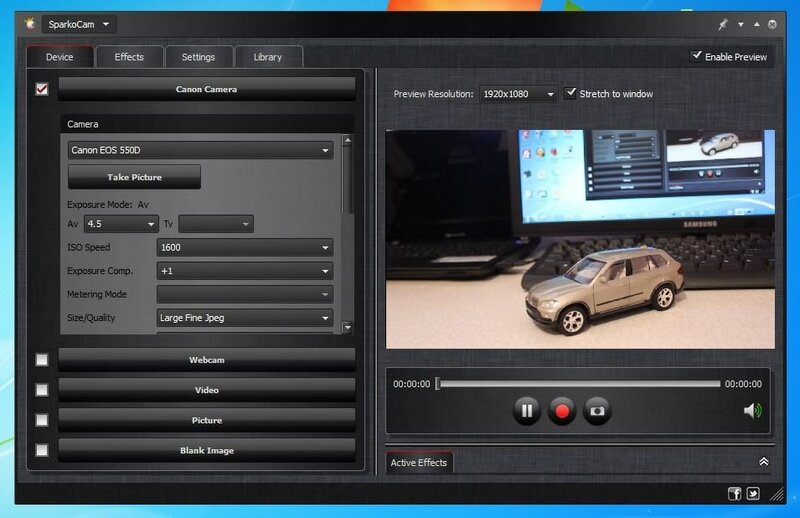 You can start the process of turning a DSLR into a webcam by downloading and installing SparkoCam software on your PC. Your computer will need to have 4GB of RAM, Intel Pentium processor at 2GHz and DirectX 9.0c so the software can function properly. Launch the software after the installation is complete and connect the camera to the computer using a USB cable. SparkoCam will auto-detect the DSLR, and you'll be able to adjust the video recording settings by accessing the Device tab in the software's main window. You'll be able to change all of the camera's standard features such as ISO, White Balance or Exposure. Make sure that the focus is set properly because if it isn't your video may end up being blurry. The Effects tabs hosts a wide range of different image masks and overlays, that can assist you in making an entertaining video. 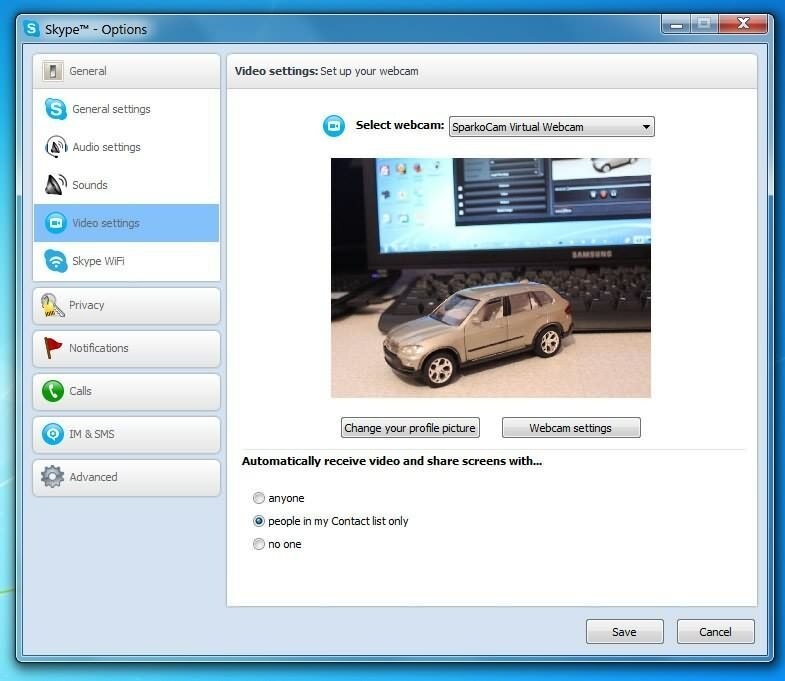 Launch Skype or any other software you intend to use during the webcam video recording session. If you are using Skype you should go to the Tools menu and click on Options. Select Video Settings option from the new window and choose SparkoCam. All videos recorded with the free version of this software contain a watermark. The full version of the SparkoCam costs $30. Please note that yo can not capture the built-in microphone audio of some Canon and Nikon cameras, so you may need an external microphone to enable voice. If you would like to utilize a DSLR as a webcam on a Mac computer, you will first need to download two different programs that will enable you to pull this off. The first software is called Camera Live and it can be downloaded for free from the GitHub, the second is Cam Twist, and it can also be used free of charge. Once you've installed both of these software products on your computer, you should launch Cam Twist and adjust the video recording settings. Change the video resolution to 1920X1280pixels or more if your camera supports higher resolutions and set the frame rate at 30fps. In the next step, you should restart Cam Twist, and connect the DSLR to a computer via the HDMI or the USB cable. The Camera Live will put your DLSR into recording mode as soon as you open it and it will launch the Syphon server. Head over to Cam Twist, locate the View menu and select the Main Window option. Double-click on the Syphon option in the new window, then select the Live Server option and start your new webcam video recording session. Instead of using software to turn a DSLR into a webcam, try a simple device called AJA U-TAP that converts all HDMI signals to USB 3.0. You will still need to install a webcam recording tool on your computer. This method of turning a DSLR camera into a webcam can be used with Windows, Mac and Linux operating systems, although you will have to choose a different software for each OS. Both the audio and video signal must be transferred together through the HDMI, but a lot of cameras, especially older models don't provide this option. In order to fix this issue, you can try using some powerful webcam recording tools which offer better audio recording options. 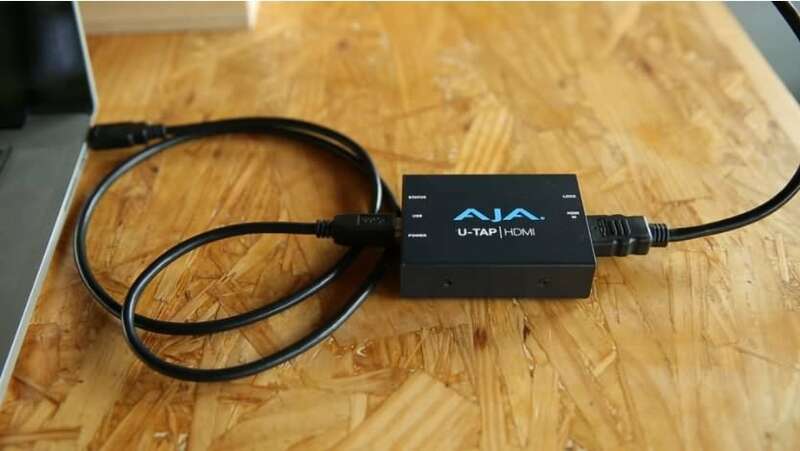 The setup process of the AJA U-TAP HDMI converter is fairly simple. You should first plug the Mini HDMI into your DSLR camera and then connect it to the converter. Afterward, you should plug AJA U-TAP into a USB slot, and launch the webcam recording software of your choice. Select the converter as the primary audio and video source from the software and start recording your webcam video with a DSLR camera. This method of turning a digital camera into a webcam is a bit expensive, because the device costs $345 in the US. CamLink can help you turn any DSLR with an HDMI output into a powerful webcam. The device works as a USB stick that has an HDMI slot on its rear end, which can be used to connect a camera to the device. CamLink is compatible with all Mac and PC computers that have USB 3.0 ports. Setting up the CamLink is a quick process because you just have to plug it into a USB slot and connect a camera to it with an HDMI cable. You can use Elgato's game capture software or any other webcam recording software during the recording session. Make sure to adjust the frame rate and video resolution settings before hitting the record button. In order to get the best results, the HDMI output from a DSLR camera has to be unprotected and you will have to turn off every option that might interrupt the recording. 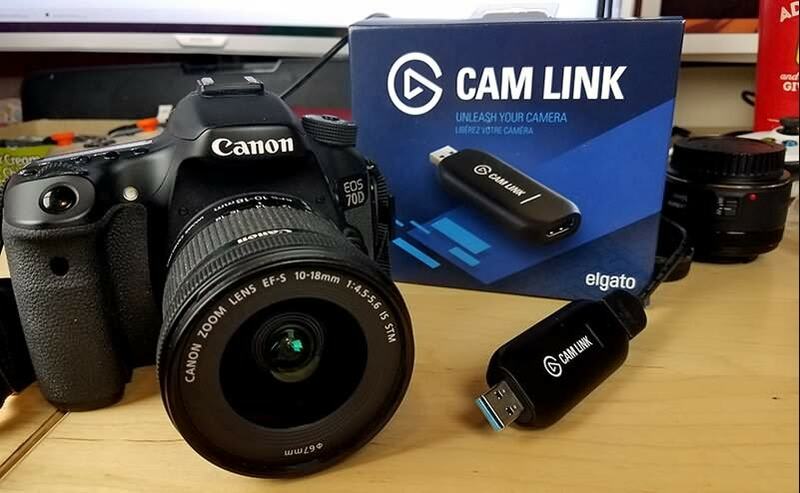 In addition, the process of using a DSLR as a webcam via CamLink can drain the camera's battery, and for that reason using an AC adapter is advised when running a lengthy webcam recording session. CamLink can be purchased for $129, which makes it an affordable option for anyone who wants to turn their DSLR camera into a webcam. This is yet another powerful device that enables you to connect a DSLR or any other type of digital camera to a Mac or PC computer. Similarly to CamLink, Kapchr turns a DSLR into a webcam by enabling you to connect the camera to the device via the HDMI cable. Kapchr also features an audio input that can be used to connect an external audio recording device such as a microphone or a mixer with 16bit and 48 GHZ quality. Simply plug in the USB cable into the device and then connect it to a computer. Use the HDMI cable to connect the camera with Kapchr, as well as an audio jack if you want to record sound from an external source. Kapchr lets its users capture video at 350 Mb/sec and it doesn't require any special webcam video recording tools. WireCast, OBS Studio or Twitch are all compatible with Kapchr and they can all be used equally effectively to create webcam videos. This piece of equipment may be out of the price range of an average webcam videographer, but at just $249 it is a great choice for all professionals who want to produce webcam videos of the highest quality. Webcams simply don't have the same capability as DSLRs that can produce a high-resolution video with vivid colors and a remarkable level of detail. Controlling the exposure, aperture or ISO settings on webcams isn't really an option, while adjusting these values on a DSLR camera is an easy process. Each of these features can be used to increase the quality of the videos you are producing. DSLR cameras enable its users to record videos in a much higher resolution than webcams, and as a result, videos captured with a DSLR have higher levels of detail and look more visually pleasing. Besides providing the possibility to attach an external microphone, DSLR cameras also have better built-in microphones that produce a clear audio recording, unlike the microphones webcams use, that easily pick up background noises.